Their outstanding new flagship instrument features their latest award-winning technologies including the Nord Lead A1 Synth Engine with sample playback, the acclaimed Nord C2D organ, a greatly enhanced Piano Section and extensive hands-on Effects - all in one exceptional performance keyboard. The Nord Stage 3 features a wide selection of Grands, Uprights, Electric Pianos, Digital Pianos, Clavinet and Harpsichord from their exclusive Nord Piano Library - all handpicked for their unique characters! 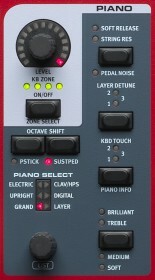 The Nord Stage 3 Piano section also features a brand new “Layer” category with rich dynamic layered patches. Nord’s state-of-the-art sampling techniques capture the extraordinary nuances and real character of the source instruments. Their unique ‘Advanced String Resonance’ and Dynamic Pedal Noise features deliver breathtaking realism and an unsurpassed level of expressiveness. The Nord Stage 3 Factory Bank features a very extensive selection of the Nord Piano Library but you can easily add or replace any of these sounds using the Nord Sound Manager. Their exclusive Nord Piano Library is constantly updated with new exclusive world class sounds, and always free of charge. 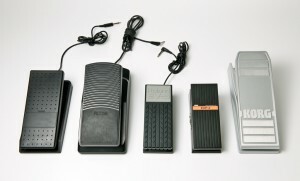 The Nord Triple Pedal (optional accessory) features thier unique dynamic sustain pedal that enables the use of half-pedaling and "release and catch" techniques and also Sustenuto and Soft Pedals. The Nord Triple Pedal also recreates the mechanical sounds of lifting and releasing the damper mechanism, producing the characteristic thomp and sizzle sounds. The Pedal Noise feature responds dynamically to the force/momentum used when pressing or releasing the sustain pedal on the Nord Triple Pedal. The Nord Stage 3 features their latest award-winning C2D Organ simulations of B3 Tonewheel and Vintage Transistor Organs plus two brand new Principal Pipe Organs. 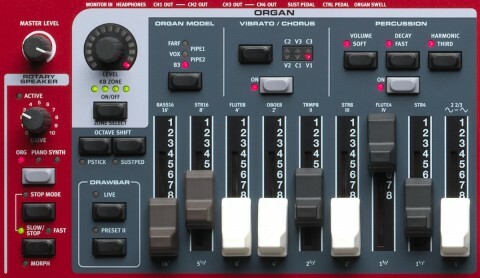 Two different Organ models can be used simultaneously and the updated vintage 122 Rotary Speaker simulation is also available for each slot independently. The Nord Stage 3 Organ section features their award winning Nord C2D organ including the extremely authentic B3 Tone-Wheel simulation with four different tone wheel settings, ranging from factory new clean to leaky old vintage. The Organ section also contains two different new Principal Pipe Organ models. These models faithfully emulate two variations of a Principal pipe section - the sets of metal pipes that commonly make up the backbone of a pipe or church organ. 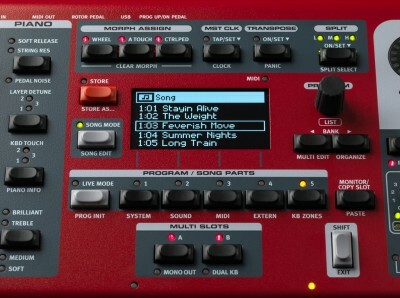 The Nord Stage 3 Synth section has powerful sample playback capabilities and comes with an outstanding selection of samples from their Nord Sample Library. 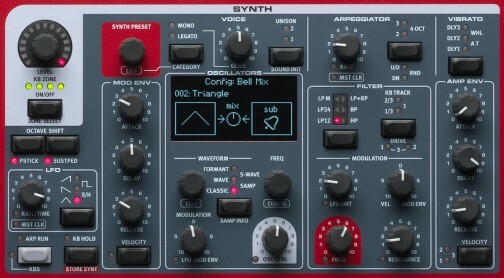 All samples can be tweaked creatively inside the Lead A1 Synth Engine and it is even possible to create and transfer your own samples using the Nord Sample Editor. Features authentic JC, Twin and Small speaker simulations with adjustable Drive, plus a separate Tube Drive simulation. This section also features a 3-band Equalizer with sweep able mid. A powerful addition is the new Filter (LP24/HP24), with Cut-off and Resonance controls that apply to the entire selected sound source (Organ, Piano or Synth). The enhanced Delay effect features morph-able controls for Tempo, Feedback and Mix (Dry/Wet), as well as controls for Ping-Pong mode and Tap Tempo. New additions include 3 feedback filters (HP/LP/BP) and a dedicated control for enabling the Analog mode. 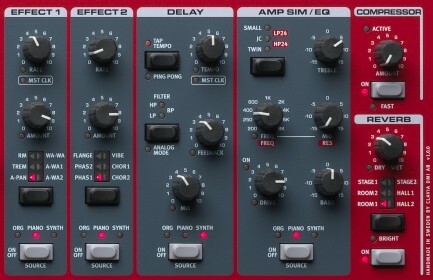 The Nord Stage 3 features six different Reverb types (Hall 1+2, Stage 1+2, and Room 1+2) for adding some ambience to your sounds, and the amount is now morph able. The Reverb effect is now separate per Slot and also features a new Bright mode.